When Home Theater Review's editor called to ask if I'd be interested in reviewing MartinLogan's new Motion 40 speakers, I jumped at the chance. Having heard multiple demos of the company's speakers over the years, I've always been a fan, yet never had the opportunity to review a pair. 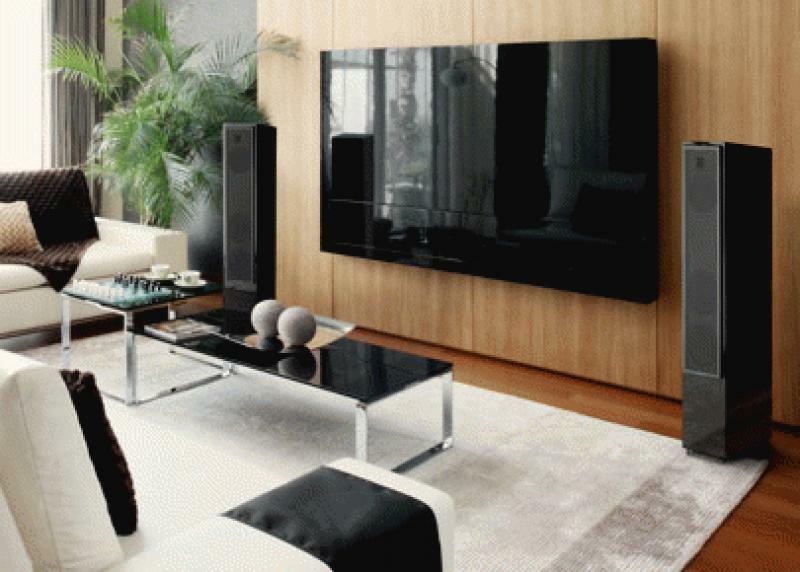 MartinLogan's speaker line is truly a "something for everyone" ensemble. You can spend $25,000 on a pair of the electrostatic CLX Art speakers, or you can drop a more level-headed $949 each for the Motion 40s discussed here. Sniffing around MartinLogan's lower price points does have benefits beyond savings, mostly in the form of trickle-down technology, courtesy of the company's high-end electrostatic speakers. It's not just smoke and mirrors, as I've experienced with other manufacturers. The shining example of trickle-down tech in the Motion 40 is MartinLogan's trademarked Folded Motion tweeter. According to the manufacturer, the tweeter has eight times the surface area of a common one-inch dome tweeter. This design is said to improve transient response, provide greater clarity and present a broader soundstage. From my experience with the speakers, this is an accurate characterization. • Read more floorstanding speaker reviews from Home Theater Review's writers. • Explore pairing options in our Subwoofer Review section. • See more options in our Bookshelf Speaker Review section. The Motion 40s come in high-gloss piano black, high-gloss white and high-gloss black cherrywood, and, as with all MartinLogan speakers, are elegant and beautifully designed. It's nice to see that this design element doesn't suffer at the lower end of the speaker line. The Motion 40s feature the aforementioned Folded Motion tweeter, a five-and-a-half-inch aluminum cone midrange driver and dual six-and-a-half-inch aluminum cone woofers. 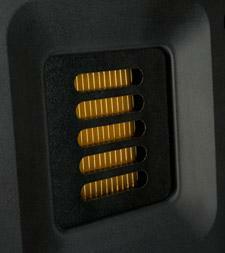 To deliver a bit more low-end authority and heft, the woofers are paired with a rear-firing bass port. The Motion 40s measure 36.6 inches tall by just under seven inches wide and about a foot deep. They weigh a stout 37 pounds each and MartinLogan recommends anywhere from 20 to 200 watts of power to drive them. The packaging of the Motion 40s was adequate and secure, about what you'd expect at this price point. I connected them to my reference system, which consists of the stunning Cary Cinema 12 processor, an Integra DTA-70.1 multi-channel amp, an Oppo BDP-93 Blu-ray player, a Cambridge Audio DacMagic, a MacBook Pro and a Music Fidelity V-Link USB to S/PDIF converter. For playback software, I used Stephen Booth's Decibel, which is an audible upgrade over iTunes. All of the cabling came courtesy of WireWorld. All critical listening was done using my laptop, save for the films, which I played on Blu-ray through the Oppo. While the Motion 40's binding posts allow for bi-wiring or passive bi-amping, I used a standard connection for this review. Speaking of the binding posts, they're sturdy and well designed, which is more than I can say for those of some other speaker manufacturers. Most high-end speaker cabling is heavy and thick, which can put quite a bit of strain on lesser binding posts, I was happy that it was a non-issue with the Motion 40s. On the subject of design, it's worth noting that the MartinLogans feature elegant, tapered lines that set them apart from much of the competition. The grille is also worthy of discussion due to its heft (it's made of metal as opposed to cloth) and its edgy, industrial design. Standing back and simply soaking in the Motion 40s' gorgeous aesthetics, it's a bit difficult to believe they retail for $2,000. 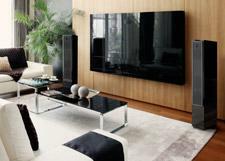 MartinLogan recommends 72 hours of break-in time on these speakers prior to critical listening. Who am I to argue? As a matter of fact, with more and more listening time, the sound continued to improve as the speakers broke in further. After the requisite break-in time, I jumped right into one of my favorite high-resolution tracks in the form of Paul Simon's "Getting Ready for Christmas Day," from his stellar new release So Beautiful or So What (Hear Music). I've been riding this track hard in my reviews lately and for good reason; it's brilliantly recorded and covers a broad range of the frequency spectrum. Paul's voice, which has lost nothing over the years, was fantastic, with tons of detail and a transparent delivery of the rasp in his voice. The background vocals in this track, which are bluesy and fun, blended seamlessly and the soundstage was wide and full. The Motion 40s are also fast and agile, conveying all of the transients and vocals with authority. Read more about the performance of the MartinLogan Motion 40s on Page 2.